What do functional water, cold-brewed coffee and sauerkraut have in common? Those products were among those trending at the annual Expo East natural-foods show in Baltimore last week. 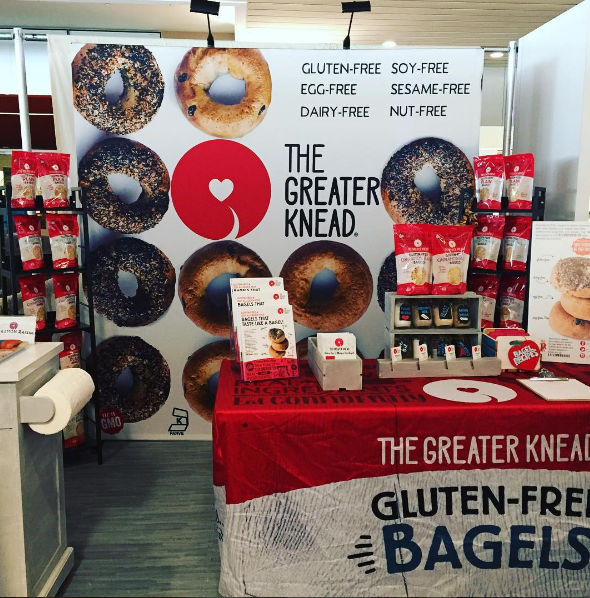 The show features new and emerging gourmet, natural and gluten-free products from across North America whose manufacturers are seeking wider distribution in supermarkets and grocery stores. 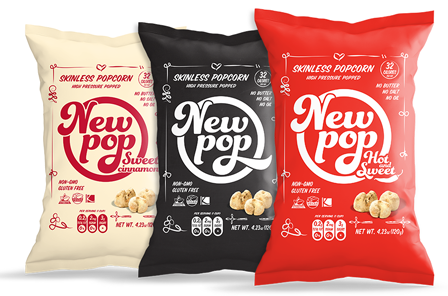 New Pop: The Original version of this skinless popcorn, one of three flavors from a New York-based upstart, reminds me of a less cloyingly sweet Sugar Smacks cereal made with corn instead of wheat. The skin on the corn kernels are peeled before being pressure popped, so there's nothing to get stuck between your teeth. A cup serving size is just 32 calories, but you'll want more - it's addicting. Each serving has 4 grams of fiber, zero grams of fat and just 3 grams of sugar. New Pop can be found at a few area markets, but mostly in the New York City area. The company also takes orders online. Tucson Tamale: This Arizona mini-chain of restaurants has begun to expand distribution of its delicious gluten-free tamales east of the Mississippi River, though they can also be ordered online. They are super easy to make and taste great. There are several vegetarian and vegan varieties, and well as dessert and breakfast versions. Smashmallow: The creator of Krave jerky is behind this new line of premium snackable marshmallows. 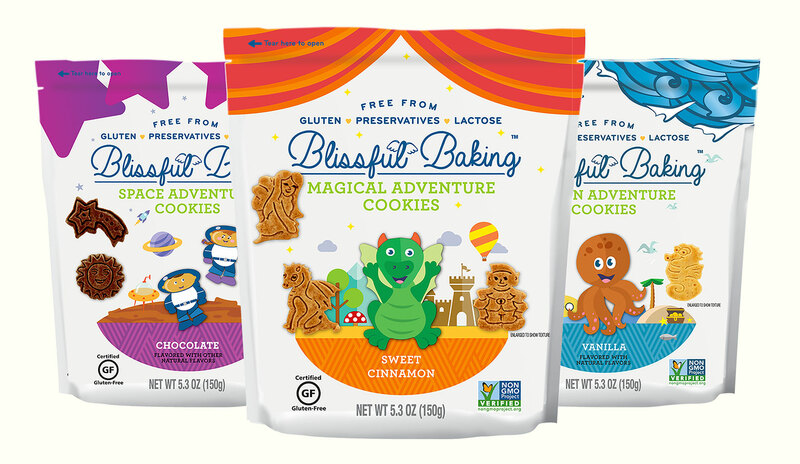 The treats are made with organic sugar and all natural ingredients, and range from 70-90 calories per serving. 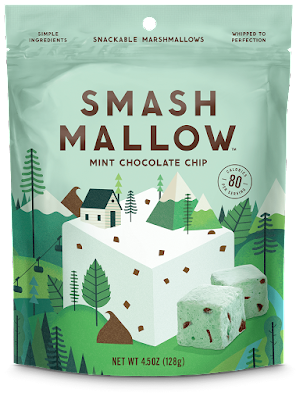 Smashmallow bites come in seven flavors, including Cinnamon Churro, Strawberries & Cream, Espresso Bean, Mint Chocolate Chip, Toasted Coconut Pineapple, Meyer Lemon Chia Seed and Root Beer Float. The Curious Creamery: Coming this week via Amazon is The Curious Creamery's new make-your-own ice cream - no machine is needed. 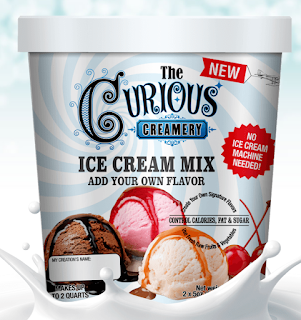 The gluten-free, neutral base can be used to customize your flavor. All that's needed is a hand mixer or stand mixer, freezer, and liquid (tea, juice or milk) or fruit puree or yogurt of your choice. The prep takes less than five minutes, followed by freezing time. I sampled a yummy pumpkin flavor that's perfect for fall. Pasta Oggi: This Montreal-based start-up got a mention in this space last year for its gluten-free ravioli, but this year its certified gluten-free pizza took center stage. The hand-tossed, stone-baked frozen pizzas have a crisp, tasty crust. Alas, these are only available in Quebec at the moment but the company is seeking U.S. distribution. Lilly's Hummus: Though there are dozens of hummus products on the market, Lilly's is tapping into the convenience factor by debuting two varieties of grab-and-go hummus and gluten-free crackers. 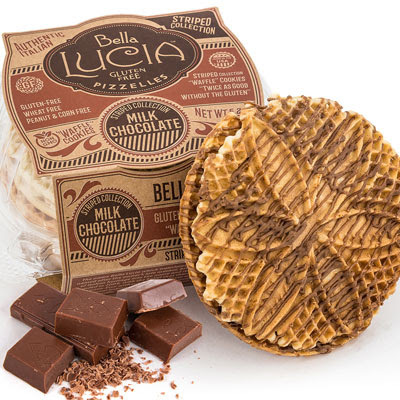 Bella Lucia Gluten-Free Pizzelles: Based on Altoona, Pennsylvania, Bella Lucia didn't announce a new pizzelle variety, but was showcasing new packaging for its anise, vanilla, chocolate, lemon, cinnamon and seasonal milk chocolate flavors. 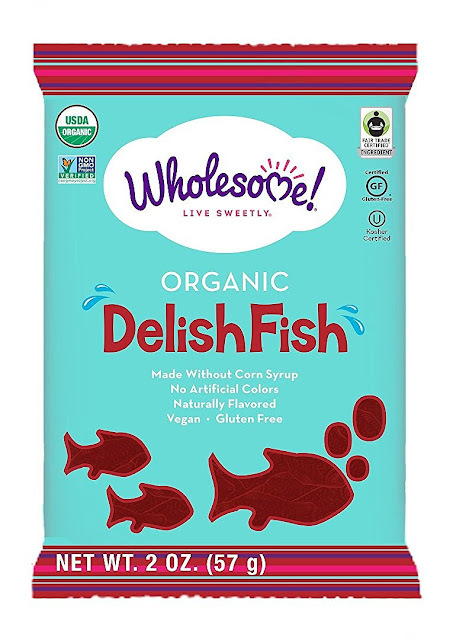 Wholesome Sweeteners: The maker of Surf Sweets gummy bears and jelly beans sampled its newest product: DelishFish, an organic version of Swedish Fish sweetened with cane sugar instead of high fructose corn syrup. The candy will begin appearing on store shelves in early 2017. Blissful Baking: These kid-friendly cookies are both gluten and lactose free and made in a dedicated facility. 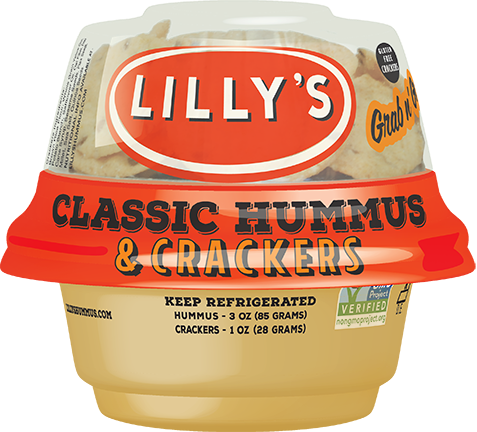 Locally, they can be found at McCaffrey's Markets but also are distributed in more than a dozen states and online. Julie's Organic: The company's popular gluten-free and organic ice cream sandwiches, long sold in cylinders, is now packaged in boxes. Paqui: Probably the spiciest tortilla chip currently on the market, Paqui's Haunted Ghost Pepper flavor overwhelmed even the most iron-mouthed 13-year-old in our family. 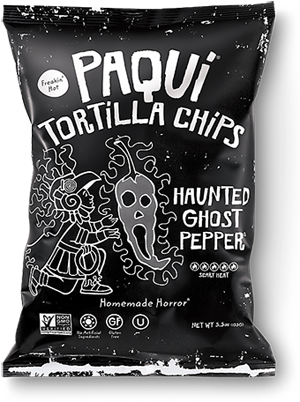 Next month the company releases a Carolina Reaper version to stores, sold as a single chip in a mini coffin. If you didn't know, the Carolina Reaper pepper is the hottest on the planet. Dieffenbach's Potato Chips: This Berks County maker of One Potato Two Potato chips displayed packaging for a conceptual product called Uglies, kettle chips crafted from rejected potatoes with minor imperfections. The sea salt, BBQ and salt & vinegar-flavored chips will have brown edges and spots but be sold at a lower price point than the company's standard line. The company may bring Uglies to retail in 2017. 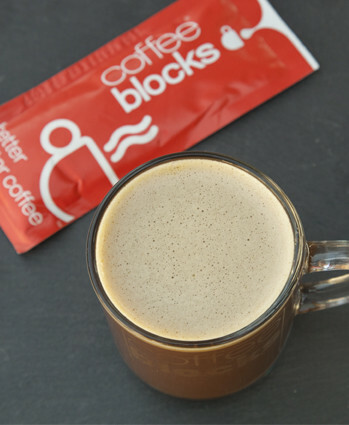 Coffee Blocks: I guess I'm behind on the bulletproof coffee trend, because I'd never tried the product prior to last week's show. I wish I had sooner, because it's darn good. This instant version, made with butter from grass-fed cows and organic virgin coconut oil, is added to hot water for a finished brew. Serenade Farms: Though it wasn't sampling, this Nevada company stood out for the fact that its line of gluten-free and organic French toast, pancake and waffle mixes comes in varieties such as apple cinnamon, blueberry and ancient grains.